When Earth is destroyed in a cataclysmic event known as 'The Reckoning,' all remaining species relocate and begin to populate the planet, Eden. The war that raged between humans and the supernatural on Earth continues, but the hierarchy has shifted. Mortis is an ancient demon, a hunter of hunters, and he roams the ravaged landscape as a hired gun. With his latest mission completed, he heads to Spring Water to collect his bounty. Once there, Blood Moon-the top Ork military commander-asks Mortis to investigate the murder of a visiting dignitary in the nearby outpost Posideon. With a promised pay-out four times more than his going rate, Mortis accepts and begins the trek. A loner, Mortis' plans are suddenly altered when a succubus joins him and the pair head to Posideon together. His travel companion, Synclair, is as unpredictable and mysterious as the terrain, but they are inexplicably drawn to one another. Deep undercover in debauchery, Mortis and Synclair find themselves thrust into a realm of slavery where the flesh traders rule. As Mortis peels back the layers of deceit in search of a killer, what he finds may prove fatal. Not only to himself, but to thousands of others, too. 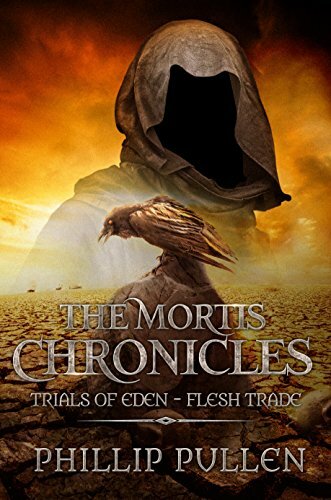 Trials of Eden - Flesh Trade; is the first instalment of The Mortis Chronicles series by the author Phillip Pullen. Book two, Hunter's Creed, is coming soon.